When vacationers think of a Caribbean getaway, Cartagena, Colombia, is not usually at the top of their list of possible destinations but it will be before long. Cartagena offers a wonderful blend of sun, sand, sea, and history. It is currently being discovered, or rediscovered, by Europeans and the cruise crowd. Located at the tip of El Laguito Peninsula in calm Cartagena Bay the Hilton is the best accommodation choice in Cartagena. The Hilton has multiple pools and beaches on three sides making it the perfect place to experience the sun, sand, and sea. 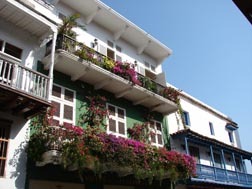 Plus it is only a short taxi ride to Old Cartagena and the area’s other attractions. Cartagena has a long, and often violent, history starting with the arrival of Don Pedro de Heredia who founded Cartagena de Indias for the Spanish in 1533. When gold, emeralds, and other riches were discovered, Cartagena became the port through which the booty was sent to Spain. To protect the riches from buccaneers and pirates, impressive fortifications were built. Most of Cartagena is still surrounded a coral wall seven miles long, 40-foot high wall, and in some places it is 60 feet wide. After numerous attacks by pirates, including Sir Francis Drake and an English force that included Lawrence Washington, George Washington’s half-brother, the Fortress San Felipe de Barajas was built. Standing more than 130 feet tall, it has a series of galleries and tunnels so linked that if a section of the fort is overcome defenders can continue fighting from the remaining sections. The building of the fortification necessitated the need for labor so slaves were imported, in part because war and disease had decimated the indigenous Carib population. 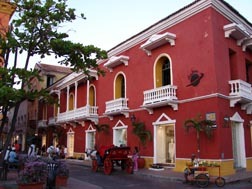 The old walled city of Cartagena is a World Heritage Site and a living museum. Just past the Puerta del Roloj, the Clock Tower, is the Plaza de los Coches, where the slaves were traded. Today it is a picturesque square with street vendors and horse drawn carriages making it hard to imagine the angst and suffering that took place there nearly 500 years ago. Even more hard to comprehend are the displays of instruments of torture at the El Palacio de la Inquisicion. Today all is serene. The Las Bovedas, the dungeons, a series of cells built in the old city walls have been converted into shops where local artisans sell their goods. Beware of street vendors selling “real” emerald and offering “a special deal just for you!” If buying emeralds in on the agenda go to one of the ubiquitous emerald stores or manufacturing sites to learn how to judge the quality and value before making a purchase. 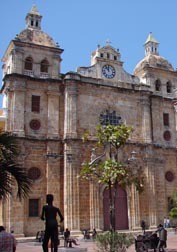 For a spectacular view of the city and harbor head to Convento de la Popa, on a hill nearly 500 feet above the city. Sometimes known as Goat's Leap, t was once the site of worship by the indigenous people, and legend has it that their symbolic solid gold goat was thrown off the precipice by missionaries making one wonder if it is still in the waters below. The sea holds many treasures. One of the richest wrecks of the Spanish Main is the on the San Jose, which sank 300 years ago carrying 116 chest of emeralds, 30 million pieces of gold, plus silver and other riches thought to be worth three billion dollars. With three pools, tennis courts, and beaches, the Hilton is the perfect place to kick back. Order room service, sit on the balcony, and enjoy the view. Shuttle boats crisscross the bay, huge cruise ships pass by, frigate birds and pelicans glide above the water in search of food, and in the evening the lights on the rise of land across the bay twinkle as do the stars above. There is always something to see from the balcony. The hotel is a popular destination for corporate groups. From the room’s balcony watched the staff set up dinner for hundreds – always elegant even if it is on the beach. Some events had live music so non-invited guests are privy to a free musical show – albeit from their balcony. In the morning is time to start another day of fun in sun in Cartagena.